The Low-Down: Which Industries Are Investing In AI - And For What Purposes? Which Industries Are Investing In AI - And For What Purposes? One enterprise's problem is another's opportunity. As artificial intelligence is becoming more important to a range of industries, more of them are investing internally. This is in part so as not to become too beholden to Big Tech, but also because they cannot afford to pay the limited pool of talent what it demands. While in the past, AI may have been considered the province of large tech companies, increasingly non-tech firms are embracing how it can improve their performance. The vast majority of spending is done internally, and very little of it is done purchasing artificial intelligence applications from other businesses. 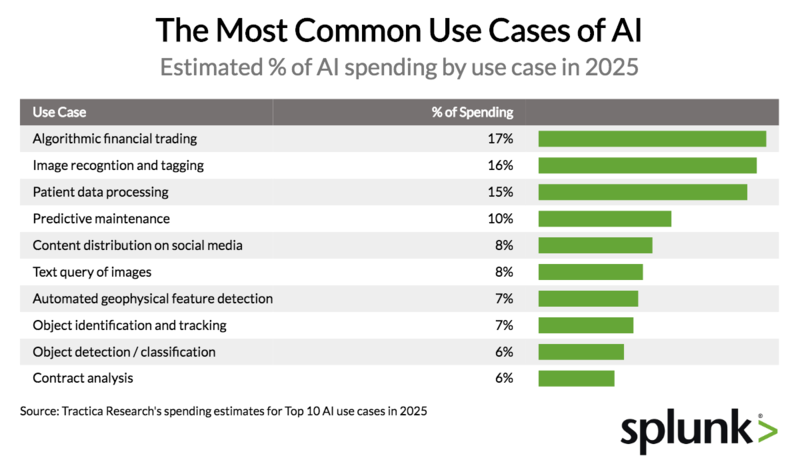 62% of AI spending was for machine learning, forms of AI that use data to learn about and accomplish a specific task. There are only 300,000 AI engineers in the whole world. Firms making the largest investments in AI are among the few who can afford the market rate for the talent. We found that much AI investment is currently dominated by large tech companies like Google, Amazon, Baidu and Microsoft. However, between 10% to 30% of non-tech companies are also adopting AI technologies, depending on the industry. While non-tech companies have yet to play a large role in artificial intelligence investment, the current market is a fraction of its projected size. Put differently, AI is at a very early stage in its development and industries that invest heavily in the next few years can still be ahead of the curve. The term artificial intelligence typically refers to automation of tasks by software that previously required human levels of intelligence to perform. While machine learning is sometimes used interchangeably with AI, machine learning is just one sub-category of artificial intelligence whereby a device learns from its access to a stream of data. When we talk about AI spending, we’re typically talking about investment that companies are making in building AI capabilities. While this may change in the future, McKinsey estimates that the vast majority of spending is done internally or as an investment, and very little of it is done purchasing artificial intelligence applications from other businesses. In 2016, McKinsey pegs that approximately $34 billion was spent on artificial intelligence development. The vast majority of that was internal corporate spending. 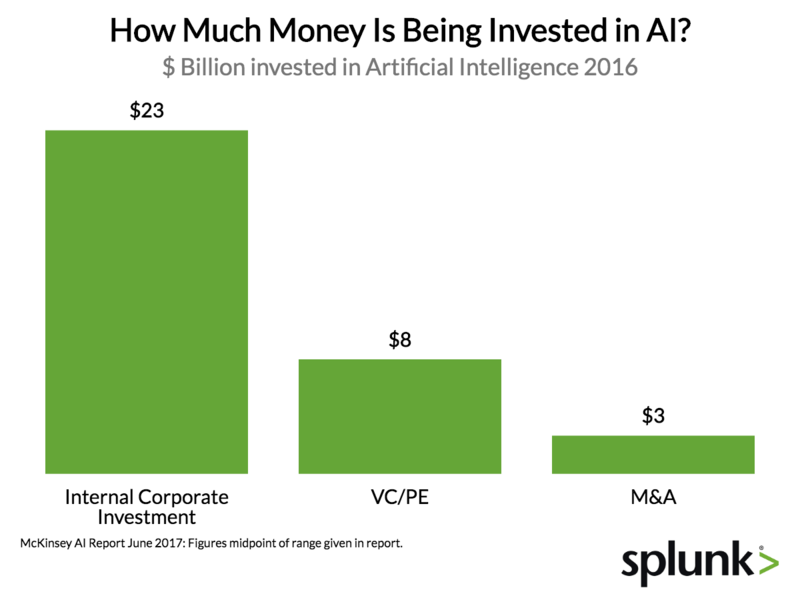 Internal Corporate spending makes up $23 billion of AI investment, nearly three times more than the current levels of venture capital and private investment in the space. This massive amount of investment is not evenly distributed among firms, however. McKinsey estimates that tech giants like Google and Baidu spend $20-30 billion per year on AI, the vast majority of this category spend. Outside of big tech, the amount of spending is minimal so far. Part of the way this phenomenon shows up is that the market for AI software is still quite small. According to Tractica Research, the amount of spending for 2018 was forecast to be less than $10BN. 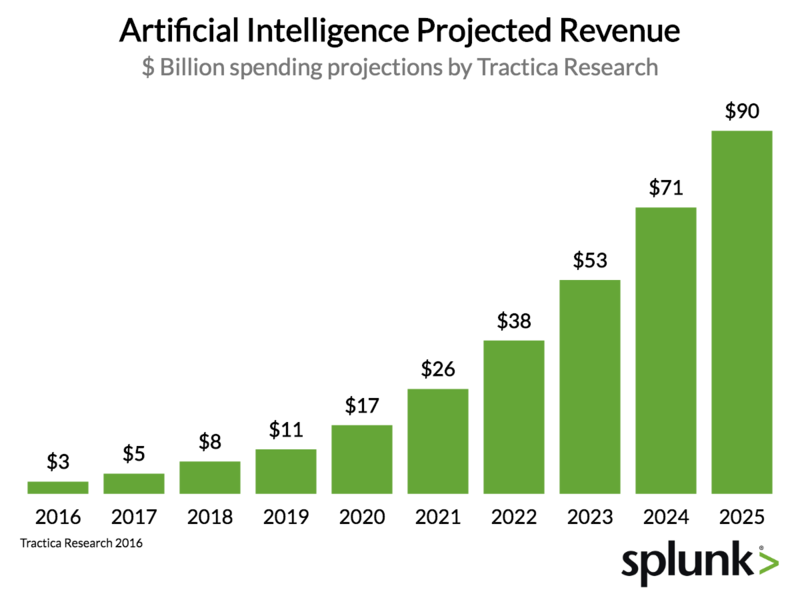 While current levels of external spending on AI software are dwarfed by internal spending today, the AI software market is expected to grow rapidly to nearly $90BN by 2025. For companies that are still considering their level of investment in AI, it may be comforting to know that the market is still a fraction of its future potential and they are not necessarily behind the curve. 62% of AI spending in 2016 was for machine learning, twice as much as the second largest category computer vision. It’s worth noting that these categories are all types of “narrow” (or “weak”) forms of AI that use data to learn about and accomplish a specific narrowly defined task. Excluded from this report is “general” (or “strong”) artificial intelligence which is more akin to trying to create a thinking human brain. 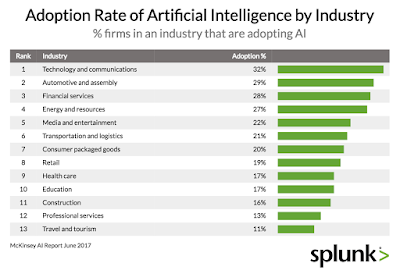 Which industries are at the forefront of AI adoption? Within any industry, there is a heterogeneity of firms and sub industries with different adoption trends for AI, so a framework for considering which industries are good candidates for AI adoption may be helpful. McKinsey surveyed 3,000 executives on their firms’ adoption of AI tech and then analyzed the results by industry. 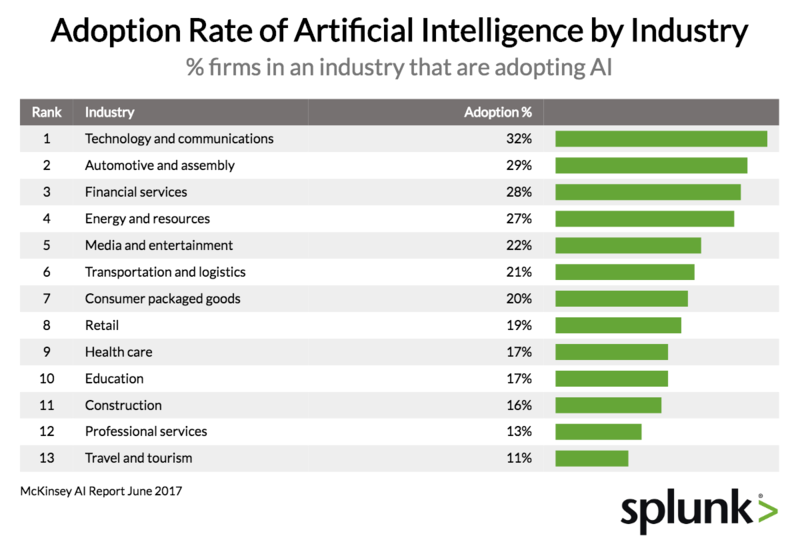 The below chart shows the percentage of firms in a given industry that have adopted AI technologies. The McKinsey survey mostly fits well as evidence supporting Cross’s framework that large profitable industries are the most fertile grounds of AI adoption. Not surprisingly, Technology is the industry with highest AI adoption and financial services also makes the top three as Cross would predict. Notably, automotive and assembly is the industry with the second highest rate of AI adoption in the McKinsey survey. This may be somewhat surprising as automotive isn’t necessarily an industry with the reputation for high margins. However, the use cases of AI for developing self-driving cars and cost savings using machine learning to improve manufacturing and procurement efficiencies are two potential drivers of this industry’s adoption. Algorithmic financial trading is the number one use case of AI spending according to Tractica, as evidenced by the enormous demand of AI engineers on Wall Street. The second and third largest projected use cases of AI are image recognition and patient data processing; perhaps we shouldn’t be surprised then to see health insurers making big plays to attract AI talent. Tencent, the Chinese tech powerhouse, has estimated there are only 300,000 AI engineers in the whole world, a pittance compared to enormous and growing demand for their skills. As a result, there is an AI talent shortage that is evidenced by high salaries and hard to fill positions. Part of the reason firms in profitable industries are making the largest investments in artificial intelligence is that they are among the few who can afford the market rate for the talent. According to The New York Times entry-level AI specialists are paid $300,000 to $500,000 per year, and that’s just the people with only a few years experience or fresh from a Ph.D. program. Some prized talent in the space have taken home more than $100 million during their time at places like Google. Some nonprofits in the space even pay their top researchers over a million dollars a year in order to compete with the private sector. 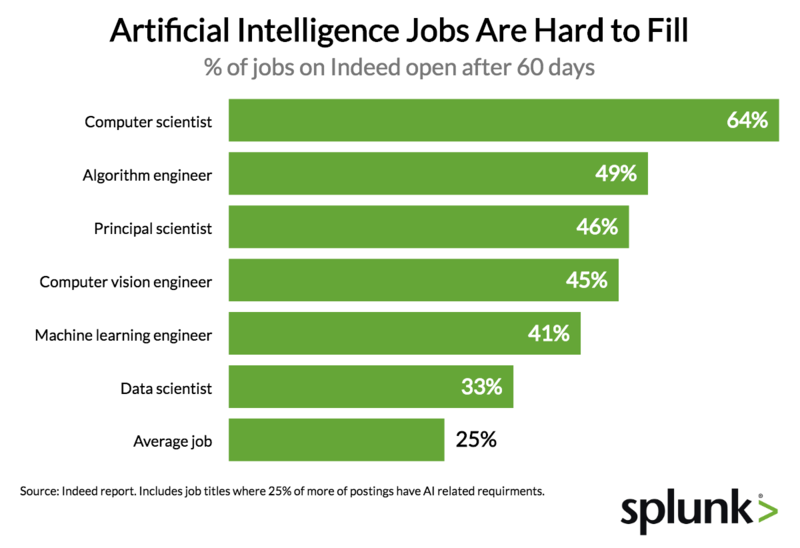 AI jobs are much more likely to be unfilled after 60 days compared to the typical job on Indeed, which is only unfilled a quarter of the time. As the demand for AI talent continues to grow faster than the supply, there is no indication this hiring cycle will become quicker anytime soon. However, when you combine the San Francisco and San Jose areas, you get a combined 19% of AI jobs, leapfrogging New York by a substantial margin. When you consider that these Silicon Valley metros only have 7 million people compared to 20 million in New York, on a per capita basis there are 4.5 times more AI jobs in this Northern California region than the New York Metro. Artificial intelligence is at a crossroads as the analysts predict the markets are poised for a takeoff. 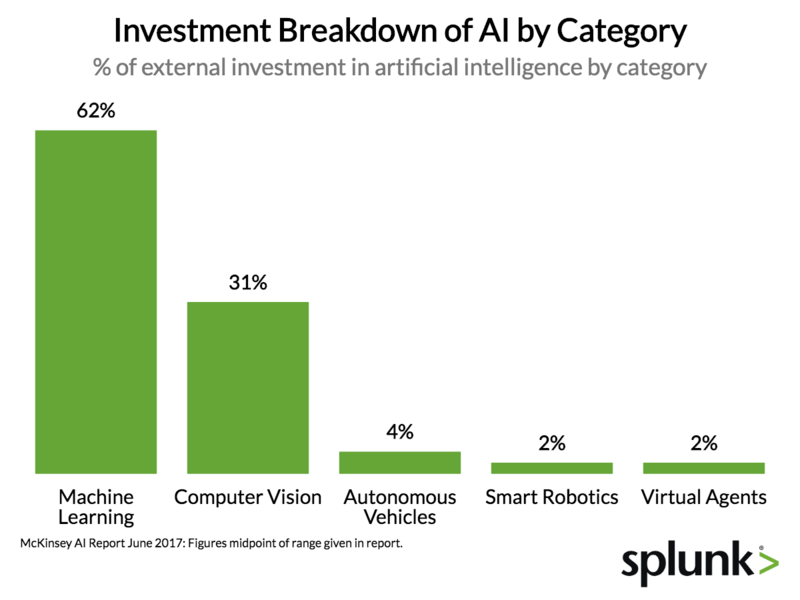 To date, spending on AI has been completely dominated by tech companies who see a clear return on investment and as a need to “future proof” themselves by being the leaders in the emerging space. Additionally, financial service firms have been quick to pick up AI talent because of their healthy margins and ability to profit any proprietary edge they can develop against the market. But for non-tech and financial services companies, the question for the next five years is whether they invest more in AI or sit it out. Already, we’re seeing some unexpected companies like Anthem attract top talent in the space. Healthcare in particular may be poised to be the next industry to adopt AI en masse given its large amount of data that can fuel operational improvements. One thing we know for certain is that it is very expensive to attract AI talent, given that starting salaries for entry-level talent exceed $300,000. A good bet is that the companies that invest in AI are the ones with healthy enough profit margins that they can afford it.